Researchers conclude that the effect of Interactive Cases on student learning is staggering. Research was conducted over three years with 2,300 students by the College of Education at the University of Georgia (UGA), to study the educational effect of Cogent Education’s Interactive CaseTM modules and SABLE (Skills and Assessments-based Learning Environment). * Cogent Education’s Interactive CaseTM modules are real-world case studies that use interactive simulations to enable students to take the role of a professional scientist. Students solve problems by making observations, collecting and analyzing data, forming and testing hypotheses, and communicating their findings. SABLE is a system that analyzes the student data as they are using the software, in real-time, and produces a “heat map” of performance (red, yellow and green) to instantly identify student’s challenges, allowing teachers to rapidly address difficulties individual students are encountering. * Graph shows student knowledge of key cell biology concepts before (pre-test) and after (post test) in either traditional 9th grade biology classes (dotted lines) or after replacement of 3 traditional lessons with 3 Interactive Cases (solid lines; cases were Diffusion, Osmosis and Filtration [aka Homeostasis]). All learner levels showed significant increases in learning. 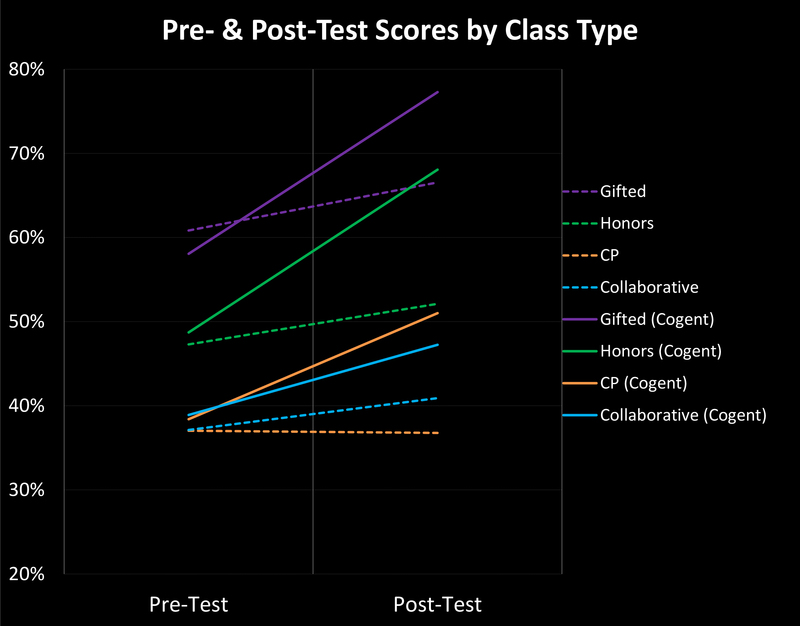 * Researchers analyzed written responses to assessments embedded within the Interactive CasesTM. 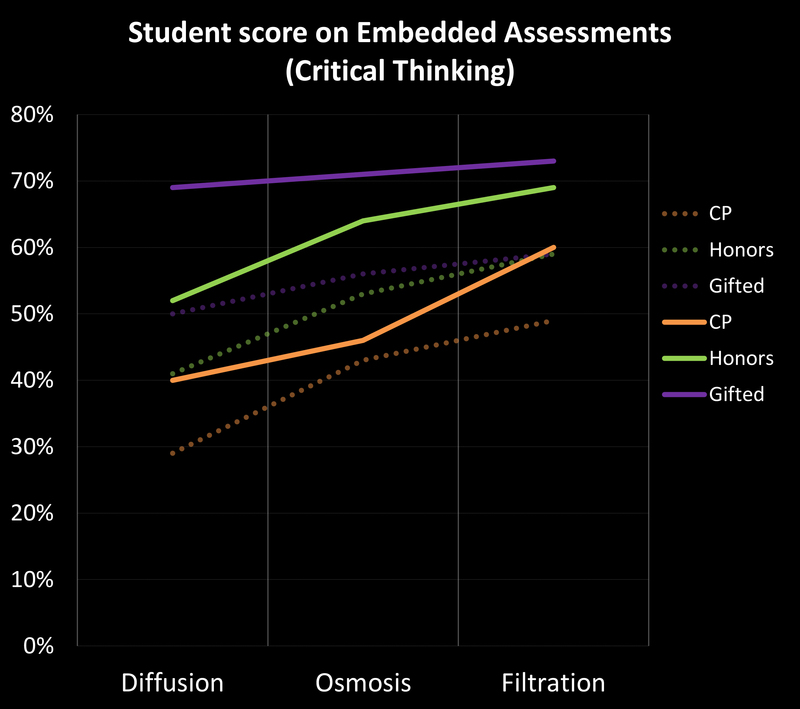 The results demonstrated that 9th grade biology student critical thinking abilities improved significantly as students completed more Interactive CasesTM. There was a further significant improvement in student abilities when teachers had access to the SABLE real time data system. Read the full summary of our research findings. * National Institutes of Health acknowledgement and disclaimer: Research reported in this website was supported by The National Institute of Mental Health of the National Institutes of Health under award number R44MH096675 and Office of the Director, of the National Institutes of Health under award number R44OD010798. The content is solely the responsibility of the authors and does not necessarily represent the official views of the National Institutes of Health. National Science Foundation acknowledgement and disclaimer: This material is based upon work supported by the National Science Foundation under Grant No. 1430187. Any opinions, findings, and conclusions or recommendations expressed in this material are those of the author(s) and do not necessarily reflect the views of the National Science Foundation.